Description: Low growing (up to 0, 2 meters), perennial, deciduous shrub with leathery, red leaves and globular, wax-like flowers. Flowers from April to June. Fruits-little black berries are round, with a flat top. 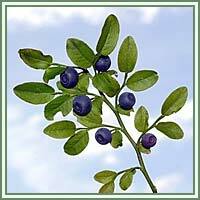 Medicinal use: Bilberry has been used as a herbal remedy for centuries, all around the globe. Tea made from the leaves is primarly an excellent antiseptic for the urinary tract, and has similar effects as Uva ursi. Taken for a prolonged period of time, it can be helpful in treatment of diabetes. Fruits are useful in treatment of diarrhoea, dysentery and high blood pressure. Distilled water made from the leaves makes an excellent eyewash, helpful in cases of poor vision and night blindness. 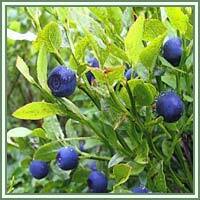 Bilberry tea is also used to treat stomach problems, and can relieve mild inflammations of the mucous membranes of the mouth and throat.